Now that's a guy who deserves his own sentence. Hell, he deserves his own paragraph! Sometimes for good, sometimes for bad; the one thing you can expect for sure is some kind of a show. 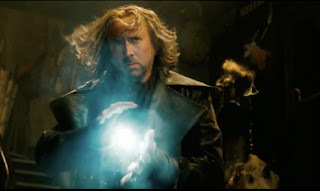 Cage's ascends to the Nic Cage of old in THE SORCERER'S APPRENTICE...a Disney flick from National Treasure series director Jon Turtletaub and produced by action-adventure guru Jerry Bruckheimer. Cage's regalia in this flick (see above) is a whole other topic. Let me say at the outset of this, I actually LIKED this flick. In fact, in the surprise of the season, The Reel Rhino has given The Sorcerer's Apprentice a shocking 4.5 of 5 horns!! I went into this feeling Jay Baruchel would never be able to hold his own in the title role, assuming this would be the big, bad hero role as well. I was wrong...he plays the lovable, reluctant hero to Michael Cera-ian proportions! Not that Michael Cera has really excelled as a hero (save for later this summer as Scott Pilgrim), frankly, I just thought Cera-ian sounded cool! The Sorcerer's Apprentice is every bit of what a summer flick should be! It has great CGI effects, a decent story line, and a great cast! Every cheeseball line in the trailer comes out 100 times better in the actual movie. Jon Turteltaub paces this nicely and the dialogue is much more succinct than some of the choppiness and awkwardness of the trailer. The story follows Balthazar, played by Cage, who is a former apprentice to Merlin...yes that Merlin, along with two other Sorcerer's who were also Merlin's apprentices. The other two included Alfred Molina, who turns up as the main baddie, Horvath and Monica Bellucci as Veronica, Cage's love interest. Molina is dapper as ever, dressed to the nines and his lines delivered with wicked intonations. Bellucci spends most of the movie trapped in a nesting doll, holding captive Morgana....Merlin's original enemy and the sorceress who hopes to accomplish THE RISING, or the raising of all morgana sorcerers. Enter Jay Baruchel, who Cage learns via ancient test, is the LAST MERLINIAN. The Last Merlinian is the only one who can stop Morgana...that is if he can learn to be a sorcerer before it is too late. The story is set in NY. I was in Manhattan on Tuesday as a tourist and I had just visited most of the filming locations, by accident, of course. This is a beautifully shot movie in terms of crisp clear views of the city with nice wide shots showing off the city. It is unique to see the battles raging in the streets of Manhattan as opposed to the forests around Hogwarts. To that end, this film about Sorcery suffers from the same problem that all movies with wizards, witches, and warlocks suffers....most of the battles become the sum of two people throwing fire balls at one and other. 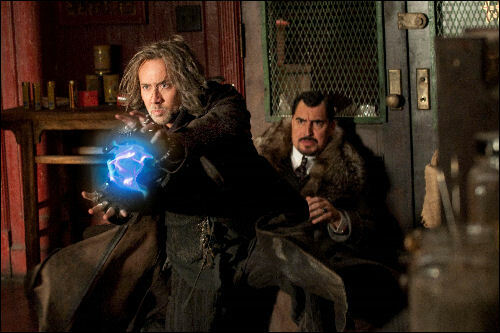 Some of the sight gags for the sorcery does raise the bar to the Harry Potter level, but it is still a tough nut to crack. I guess expecting much more would be like expecting Rocky to break out Tae Kwon Do when fighting Clubber Lang...it's just not going to happen. Let me not forget to mention Teresa Palmer who plays Becky...David's love interest. Baruchel has quite a streak going here. He got to date Alice Eve in She's Out of My League and in this, Teresa Palmer's Becky is almost a straight ringer for Alice Eve. These are some sharp looking gals and I wouldn't be surprised to learn that Baruchel was doubling as casting director! I guess this is a fantasy movie, though....just kidding Jay...you are a sharp looking guy and twice as cool! I am a fan...and I mean that in a totally hetero way. Yep, I'll give you a moment to savor all of this...4.5 of 5 from the Reel Rhino.